Suitable for enthusiastic hill/mountain walkers. The classic trek to Lo Manthang using comfortable Tibetan-style lodges throughout. I just wanted to add my personal thanks to you guys for such a superb trek. Truly the best ever: wonderful scenery & cultural environment, a magical lack of crowds, vigorous enough without being too much, perfect weather, good equipment & food and a professional and experienced guide and team that worked professionally and seamlessly and were a pleasure to interact with. A first class trip led by an excellent local guide... we had an audience with the King of Lo, visited three schools and had lots of interaction with the people of Lo Manthang. Superb scenery together with unique people making a fantastic experience. The crew were cheerful and smiling at all times and dedicated themselves to making sure that we were comfortable, well looked after and having an enjoyable experience. The food was excellent, Bhakhat, our fantastic, imaginative cook prepared wonderful, varied food for us. All in all we had a truly memorable holiday from start to finish. The organisation of this trip was very professional and the information provided was excellent, as were the guides. The pre-departure info was excellent and thorough. The local trek crew were fantastic - I can't praise them enough. MK obviously has respect for the local people it uses and the countries it operates in. The remote and mysterious region of Mustang is situated in the far north of Nepal, beyond the mountain giants of Dhaulagiri and Annapurna, and extending into the highlands of Tibet. It is a vast, high, arid valley characterised by eroded canyons and colourful stratified rock formations with a barren, desert-like appearance fringed by snow-capped peaks. Lying in the rain shadow of the Himalaya it is an ideal region to explore in the summer, outside of the normal Nepal trekking season. The ancient and ‘Forbidden Kingdom of Mustang’ has long been shrouded in mystery. Protecting its authentic Tibetan culture from outside influences, Mustang remained closed for many years to foreigners until it finally opened its doors in 1992. Trekkers though were not allowed in until 1994 and we were one of the first British trekking companies to take people there in that year. Having taken the sensational flight from Pokhara up the ‘deepest gorge in the world’ which lies between Mt Annapurna and Mt Dhaulagiri, you land at the small town of Jomsom. Already the scenery and atmosphere is Tibetan-like. From Jomsom you drive in 4x4s up dry river beds and through rivers to the village of Kagbeni, the gateway to Mustang. The next six days is a trek through astounding gorges, crossing prayer-flagged passes, and visiting holy caves, villages with monasteries and fortresses and seeing the unbelievable multi coloured cliff formations. You are now truly inside the Kingdom of Lo, hemmed in on the west and east by snow-capped Himalayan peaks, and closed to the north by a range of smaller mountains marking the Tibetan border. Finally you cross the Choge La Pass, 4,301m/ 14,111ft, and drop down to the ‘Plain of Prayers’ where you come to the only square walled city in the Himalaya, Lo Manthang. The walled city of Lo Manthang is one of the undoubted highlights of the trek and you will have time to wander the enticing streets, explore its impressive temples and possibly visit the King’s Palace where you may even get an audience with the current ‘king’, as many of our previous groups have done. For the return you take a different route to visit the second most important township, Tsarang, and a string of other fabulous villages with huge chortens, flat-topped roofs and white-washed walls. Meal arrangements: Bed and breakfast in Kathmandu & Pokhara, all meals on trek. Trekking to Lo Manthang up the western side of the Kali Gandaki Valley. At leisure in Lo Manthang or visit villages north of Lo Manthang. At leisure in Kathmandu and fly home. 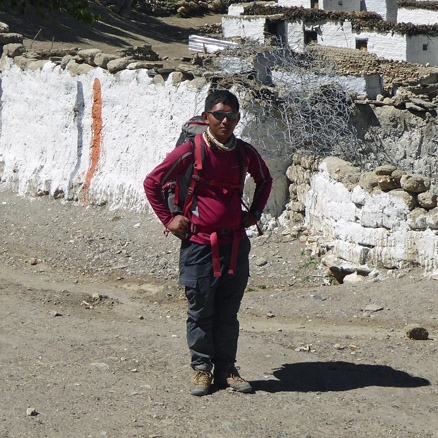 Our Sherpas have been leading treks in Mustang for many years. In fact, we have been taking groups there every year since 1994 (with the exception of the years of Maoist rebellion). We have used the same group of Sherpas for our Mustang treks in all that time. They are extremely knowledgeable about the culture, history, geology, flora and fauna of the Mustang region. Day 1 - Depart from London. Depart the UK for the overnight flight to Kathmandu. On arrival in Kathmandu you will be transferred to the Shangri La Hotel. This is a very comfortable hotel situated to the north of Thamel, the tourist district of Kathmandu. It has a lovely garden with a swimming pool where you can relax, and several excellent restaurants. The bustle of Thamel, with all its restaurants, shops and bars, is a 20 minute walk, or 10 minute taxi ride away. Day 3 - Fly to Pokhara. Transfer to hotel. Time at leisure. This morning you will take the short morning flight to Pokhara, Nepal's second city. This exciting flight passes over the terraced Himalayan foothills, with views of the main range to the north. Overlooked by the stunning spire of Machhapuchare, 'Fishtail Peak', the town of Pokhara is the start point for treks to the Annapurna region, Mustang, Daulaghiri and Manaslu. On arrival you will transfer to your hotel. The rest of the day is at leisure. Pokhara's bustling lakeside with cafe, shops etc is just a short walk or taxi ride from the hotel. Day 4 - Day 4: Fly to Jomsom, 2,743m/9,000ft - ½ hour flight. Drive to Kagbeni, 2,896m/9,500ft - 1½ hours drive. You take the 20-minute early morning flight, usually around 7am. You will get close-up views from your small aircraft of the Annapurna range, Dhaulagiri and nearby satellites. It is a sensational flight! On arrival you will be met at the tiny airstrip by your Sherpa crew. After some initial preparation of loads and a cup of tea, you drive the short distance to Kagbeni through dry river beds, and wide streams, and on the jeep road. Upon reaching Kagbeni, a very pretty Tibetan-style village, with its narrow alleyways and tunnels, irrigation canals, green fields of wheat and barley and a large red gompa (monastery), there is a taste of scenes to come in Upper Mustang. About 50 families live here, most of them traders who represent the link in the chain between modern Nepal and the 'Tibetan' peoples of Mustang. At the northern end of the village there is a sign saying 'Restricted area, tourists please do not go beyond this point'. Here, tomorrow, you will complete your paperwork formalities for you to enter this long-prohibited region of Nepal. Annapurna Conservation Area Project (ACAP) has set up a very interesting information post here with displays of Mustang artefacts and photos. Look out for the excellent coffee shop very near the ACAP office. Day 5 - Drive to Tangbe, 2,926m/9,600ft. Trek to Tetang and on to Chele, 3050m/10,007ft - 4 hours trek. To avoid the unpleasant experience of walking on the road you drive to Tangbe, 2,926m/9,600ft, a stunning village with the remains of an old castle, narrow alley ways, ochre coloured chortens and an archery ground and here are also the first black, white and red chortens that typify Upper Mustang. You take the path leading inland to the village of Tetang, again well worth exploring, before crossing the river and following the Nari Khola down to Chussang village, at the confluence of the Narshang Khola and the Khali Kandaki. Nilgiri Peak continues to dominate the southern skyline. There are three separate parts to this village and some broken castle walls on the surrounding cliffs. Across the river from Chussang are spectacular red organ-pipe eroded cliffs above the mouth of some inaccessible caves. The five villages of this area, Chele, Gyakar, Chussang, Tangbe and Tetang are home to a culturally unified group of people, closely related to the Manangis, rather than the true Lobas. There is a distinct change here, not only in topography, but there is a world of difference also in the culture, lifestyle and people. Settlements are more scattered, smaller and more basic. The people of Lo or Mustang do practice agriculture, but because of the lack of rain and fertile soil, cultivation is in sheltered plots of land creating a landscape of patterned brown, with scattered patterns of shaded greens. Continuing north, this time unavoidably on the jeep road, you reach a huge red chunk of conglomerate that has fallen from the cliffs above forming a tunnel through which the river flows. A steel bridge spans the river just in front of the tunnel and north of here the Kali Gandaki becomes impassable on foot, although locals sometimes travel this route on horseback, through a steep, narrow canyon. There are many caves here high on the fluted red cliffs above. Climbing 100m/328ft to the village of Chele, you stay in a simple but characterful lodge at the upper end of the village. Most of the houses now have sheep horns above their doorways and ghost traps. Watch out also for the ferocious Tibetan mastiffs that many of the local people keep. Day 6 - Trek to Samar, 3,660m/11,811ft, via Ghyakar and Kyuten – 5 hours trek. Climbing from Chele after breakfast you come to a place where you can see the village of Gyakar across a huge canyon. Here there is a very impressive suspension bridge which you cross and a short climb brings you to fields of barley topped by a wood of large trees. There is no shortage of water here. Then you arrive at the entrance gateway and tunnels under houses that lead to the small square of Gyakar which boasts a single tap and a washing place. Leaving the village you go gently up through odd looking bushy plants and dog roses. It becomes drier and more arid. Continuing up you come to a big gulch and drop down to a stream and then up into a narrow defile. From the exit of the defile it is a long contour round to the village of Samar. As you walk up from Gyakar look across to your right and you will see the old cliff path that used to be the main path from Chele to Samar. Some people do still use it apparently. Samar sits in a grove of poplar trees and is a major stopping place for the mule caravans coming from Tibet. Day 7 - Trek to Syangboche, 3,770m/12,369ft, with visit to holy cave of Rangchung – 5 hours trek. From Samar you drop steeply down into a box canyon and up the other side. Then into another box canyon with an enchanting path that zig zags up and out of that canyon. Next is a long steepish climb to a pass which is about 3 hours from Samar. From the pass you start the long descent into the stupendous gorge. Absolutely jaw dropping! Down and down you go into a seemingly bottomless world, passing huge, vertical, eroded, red cliffs. Eventually you come to a stream and a bridge and here you turn left to visit the holy cave of Rangchung - approximately 40 minute round trip from the stream crossing. Guru Rimpoche is said to have meditated here on his way to Tibet and the cave contains many sacred relics and statues that 'grow'. Leaving the bridge, it is up and up and up, out of the bowels of the earth to reach the four house hamlet of Syangboche. The Dhaulagiri Hotel is a very pleasant lodge for the night. Day 8 - Trek to Ghami, 3,520m/11,549ft – 6 hours trek. Leaving Syangboche it is 15 minutes uphill to the large coloured chorten that marks the Syangboche La, 3,850m/12,631ft, from where there are fabulous views over to the east. Traversing on from here you come to a descending cliff path with a stream at the bottom, half an hour from the chorten. It is only 10 minutes up from here to Tamagaon, 3,710m/12,172ft, another small hamlet. Another half an hour or so brings you to a tea-house shop called Chongar. Again, further on for an hour there is another one house tea-shop called Zhaite, a great place to have lunch - inside the house it is spotlessly clean. During the day you will pass many chortens along the way. Always keep to the left as it is bad 'Karma' to go the wrong way round. This is perhaps the driest part of Mustang and much of one's energy is spent negotiating loose, dry soil. However the magnificent views of the countryside, the gentle contours of the north in contrast to the rugged mountains in the east and west are a source of inspiration. Then there is a memorable trail to the Ngi La Pass at 4,045m/13,271ft. This pass is regarded as the southern boundary of Upper Mustang. The descent is nice and gentle until you take the footpath trail over the Ghami La Pass, 3,765m/12,352ft, and a beautiful contour leads you closer and closer to the compact village of Ghami. Behind the village look for the diagonal path up the dry hillside - that is the start of your route tomorrow. In the afternoon we highly recommend walking half an hour from Ghami to the west to see the amazing cliff cave dwellings - unbelievable! In Ghami you will stay in one of the best lodges in Mustang, owned by the 'royal' family there. You stay in the relatively new lodge and eat your meals in the ancient, large, family house, full of interesting things! Day 9 - Trek to Lo Gekhar, 3,934m/12,907ft, via Dhakmar – 6 hours trek. Leaving the magnificent Royal Mustang Lodge you walk down out of town to cross the river and climb up the other side. The diagonal path leads easily up across a dusty mountainside to a pass, the Deurali La, 3,717m/12,195ft. Looking back there are fine views of Ghami and you can see the state of dereliction of the old original palace. The path contours round the end of the next valley and you start to see the famous red cliffs above Dhakmar. The closer you get the more sensational they become, peppered here and there with clusters of cave dwellings. It is an easy descent into the valley where shortly you will come to a single house. In 2017 there were two women here, churning butter and weaving Tibetan apron material. You then pass an old manor house directly under the red cliffs. The legend has it that Guru Rimpoche slew a dragon here and the cliffs were soaked with its blood. Beyond there is a scattering of houses and the path now passes trees and fields before entering a very dry gully. You climb slowly up through eroded rock formations past fluted rock columns on your left. Out of the top of the gully you arrive at a flattish plateau. You contour round to the actual pass, the Marung La, 4,042m/13,261ft. This has wide views over Mustang and down below you can see the monastery of Lo Gekhar. This is one of, if not the most important, temples in Mustang and it is surrounded by chortens daubed a rust colour. It is said to date back to the 8th century when Guru Rimpoche came to slay the demon that was preventing the building of Samye Monastery in Tibet. The temple was built on the dead demon's heart, under the main statue of Guru Rimpoche. The inner temple is the pure essence of Tibetan Buddhism, and there is a real, tangible power in the place. It is also a school for boy monks. Day 10 - Trek to Lo Manthang, 3,770m/12,369ft - 4-5 hours trek. So, from Lo Gekhar you have to cross the range of mountains ahead and then descend to Lo Manthang. First you drop the short distance to a bridge over a stream and start the long haul to the pass. It's a good area for spotting wildlife and you may see yaks, marmots and eagles. It takes 2½ hours to reach the Chogo La Pass at 4,301m/14,111ft. Before this there is a lovely meandering path contouring along a ridge. From the pass it is a long way down through desolate scenery to the 'Plain of Aspiration'. The main entrance to the city of Lo Manthang is on the northeast corner, so you circumambulate the wall to the gate, where you may find a group of people spinning wool and gossiping. Day 11 - In and around Lo Manthang. Walk to Namgyal village. This day will be spent at leisure in and for exploration around Lo Manthang. The city is an absolutely fascinating place, with narrow streets and houses built adjoining the city wall and it contains about 150 houses, plus many cells for lamas. There are three major temples within the city and there is a caretaker with a key available at certain times. These temples really are very impressive, with huge clay statues of various Buddhas. There is a large amount of renovation and restoration taking place in all the temples in Lo Manthang and this is going to take years to complete. The 2015 earthquake also did a lot of damage and part of the palace, an imposing 4-storey building in the centre of the city had to be demolished. The last king was an active horseman and kept a stable of the best horses in Mustang. He also bred Lhasa Apso dogs and had several monstrous Tibetan mastiffs. His son, Jigme Bista, is rightfully the new king of Mustang although the present government of Nepal has passed a law forbidding royal titles. He is therefore the 'unofficial' king. There is plenty of time on this day to hike out to the village of Namgyal, one hour from Lo Manthang. There is a monastic school here that has a small museum. Then, if energy and inclination remain there are a couple of choices for you. Firstly you could climb up to the old ruined castle that sits atop the nearby hill. It only takes an hour and the views are unbeatable. There is a fabulous walk down from the castle to Lo Manthang. A second option would be to continue north up the valley to see the summer palace of Thinggar. Again it is only about an hour and is exciting country - you can almost smell Tibet from here! A round trip to Thinggar and back would take a total of about 5-6 hours. Day 12 - Drive to Tsarang, 3,520m/11,549ft, and visit monastery. Trek to Drakmar and back to Gghami past long Mani Wall. 6-7 hours trek. Sadly you now have to begin the trek out of Mustang and say a fond farewell to Lo Manthang. The aim for the return trek is to see different places and new paths. Therefore today you first drive to Tsarang, Mustang's second most important township, avoiding trekking this section because it is well used by vehicles and very dusty. The drive is only about an hour. An early start would be a good idea though as there are a number of excellent things to see in Tsarang before trekking to Ghami. You may visit Tsarang's Thubten Shedrup Dhargyeling Monastery with its amazing murals and also visit the Samdrup Gedphel Palace which is now a small museum. Then it's time to take the uphill path between two hills up the Syoda Khola to reach Dhakmar again. You then trek back to Ghami but on the lower trail, not crossing the Deurali La, but taking instead the path that leads to the longest mani wall in Mustang. The legend has it that this tremendous construction is built on top of the intestines of a demon slayed by Guru Rimpoche. No doubt you will be looking forward to the now familiar lodge in Ghami. Day 13 - Trek to Geling and Syangboche - 6-7 hours trek. You now take a different path back to Syangboche. From Ghami there is a track away from the jeep track which does not involve crossing the Ghami La. This leads through wild country to the village of of Geling (also called Ghilling) which you will have looked down towards on your route in. This is another stunning Mustang village. From here you do have to follow the road to Syangboche. Day 14 - Drive to Samar – approximately 1 hour drive. Trek to Chussang - 4-5 hours trek. Again to avoid a tiresome stretch of road you will drive to Samar on the upper road. This is a relatively short distance. From Samar you trek to Chussang. It may or may not be possible to descend the original cliff path that we always used before 2015. However the path did suffer some damage at that time and if it has not been repaired then you will trek back down through Gyakhar and down through Chele and on across the river to Chussang. Day 15 - Drive to Jomsom - 1½ hours. Today you take the short jeep ride to Jomsom to avoid walking on the road. Jomsom is the administrative headquarters of the region and a busy town full of local officials as well as the usual traders and travellers. Day 16 - Fly to Kathmandu via Pokhara. Transfer to hotel. At leisure. Today you fly from Jomsom, through the Himalayan mountains, down the Kali Gandaki Gorge, feeling like an insect in such grand surroundings, to land in Pokhara. From Pokhara you will fly to Kathmandu where you will be met and transferred to your hotel. No doubt you will be shell shocked on returning to 'civilisation'! Day 17 - At leisure in Kathmandu. Kathmandu, Asia's former hippie capital, has a wonderful mixture of crowded bazaars, Hindu and Buddhist temples, shrines and stupas, colonial and ancient architecture as well as more modern buildings. You could explore the bazaars and temple complexes of Durbar Square to best absorb the myriad impressions assailing your culture-shocked senses. You could also hire a mountain bike, or take a ride out to the fascinating city of Bhaktapur, an hour, or so east of Kathmandu. There are plenty of excellent places to eat in Kathmandu, cheap, noisy and cheerful in Thamel, or more luxurious in the surrounding areas of the city. Day 18 - Transfer to the airport. Fly to London. Flight Inclusive price reduced from £3,575 to £3,425. Offer subject to availability - book now. Mustang truly is Shangrila-la. The scenery is beautiful - something new around every corner. The Tibetan culture teaches you many many new things daily. We had the most wonderful holiday. The use of guides with local knowledge was fantastic. The quality of accommodation and food was superb. Great experience.